I too love the reverses of these coins! It harkens back to a different time when men were men and sheep were scared 😂. I am seriously wanting to get into these old 20 Marks Justin not sure where to start in terms of rarity. I think the simple answer is: rarity. The total mintage for the Heinrich XXII (KM 125) is a mere 1510 coins, as opposed to the over 1.6 million Wilhelms (KM 537) minted in 1915. There are obviously far fewer surviving specimens of the former, thus, much higher price. I love the reverses of both of those coins, by the way. 1983 d penny Planchet error? Thank you for the information about what are mules. confirms my initial thoughts about the A. 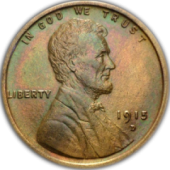 A mule is a coin struck using two dies that were not intended to be used together. I can't tell if the A is showing machine doubling or something else. Since i don't see doubling elsewhere I doubt it is a doubled die, I also doubt they were doing individual letter repunching, so most likely it is machine doubling. Yes, it was plated and now someone has unplated it. It didn't come from the mint like that. Only in the sense that they never should have used copper plated zinc. You get breaks in the copper plating and the zinc planchet corrodes fairly rapidly. So what did it weigh? The 85o is a pretty coin that won't grade above ms63. The reverse is nice but the breast is really weak. Typical of that mint . A really nice common Morgen. Which coin is be the best deal to buy? Personal opinion, whichever one you like the best. That is gorgeous!!! I bought my first medals in Pittsburgh at the ANA. I like that medals are way rarer than a coin from the same period, yet many are still somewhat affordable in high grades. I have started collecting what I like instead of what everyone else places value on. I'm sure that piece is going to make the new owner very happy. Thank you for ur warm welcome and the honest information. As I said I am very new. But I do find it fascinating. So I will surely stick around for interesting learning.